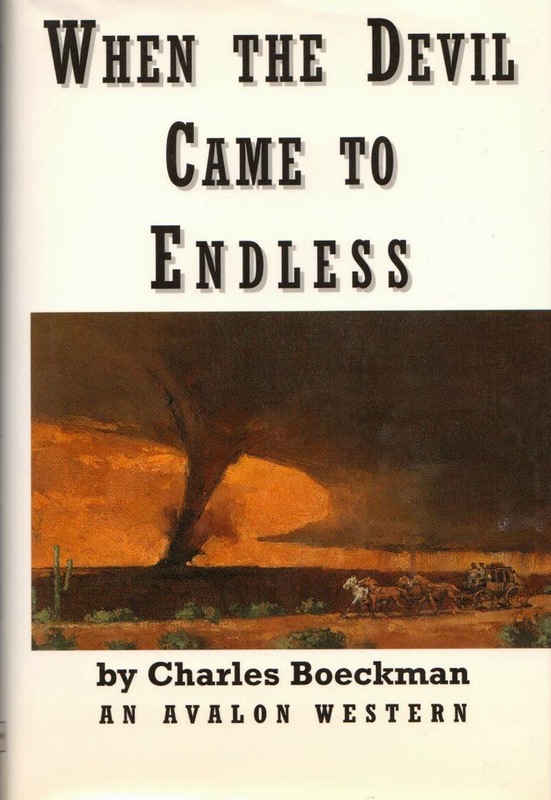 I've become a big fan of Charles Boeckman's Western pulp stories over the past couple of years, but WHEN THE DEVIL CAME TO ENDLESS is the first Western novel of his that I've read. Published by Avalon in 1996, it came out long after the pulp era was over, but it shows that Boeckman had lost none of his top-notch storytelling ability. Endless is a small town in West Texas, and as the book opens, a huge, deadly tornado is bearing down on it. The twister strikes with incredible force, devastating the town and leaving death and destruction in its wake. WHEN THE DEVIL CAME TO ENDLESS is a really well-paced book that kept me turning the pages all the way to its very satisfying conclusion. In addition to being a fine traditional Western novel, it's also a fairly clued murder mystery, and Boeckman handles both elements well. The setting also rings true, as anyone who's spent some time in West Texas will know. I believe Amazon bought Avalon's inventory a while back, but this one doesn't seem to be in print. Used copies are available on-line, though. It's excellent work from a top professional and gets a high recommendation from me.